Office depot toner cartridge MLT D205L. Compatible cartridge. Suitable for the following printers: HP Color LaserJet CP3525X CP3525N CP3525DN CM3530FS MFP CM3530 MFP. Page yield: 50000 pages. Colour: black. Office Depot Toner Cartridge CB381A. Manufacturer reference number: CB381A. Remanufactured: No. Compatible brand: HP. Original or compatible: Compatible. Print colour: Cyan. Short cartridge reference number: 824A. 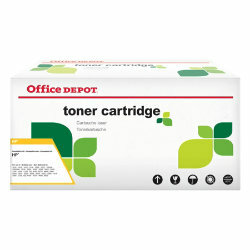 Office Depot toner cartridge CE2555A. For up to 10.500 sheets maximum 5% coverage. Colour: black. Compatibility: HP Color Laserjet CM 3530 FS MFP CP 3520 Series CM 3530 MFP CP 3525 DN CP 3525 N CP 3525 X CP 3525.